The Raven Theatre and More! Hi everyone! I hope you're having a great weekend so far. 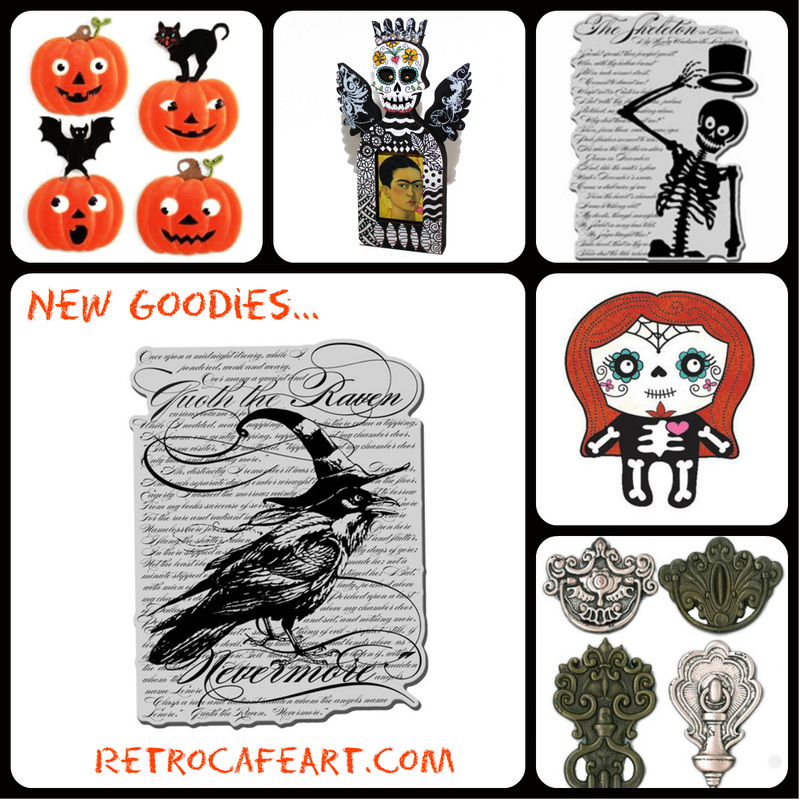 We have several awesome new Halloween goodies in the shop this week. 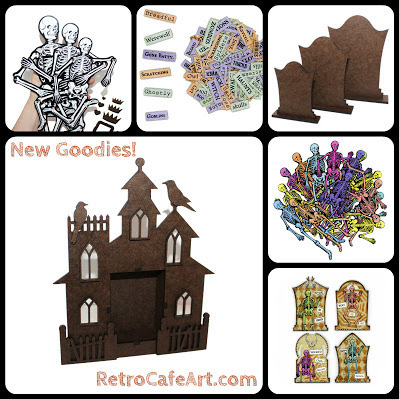 Tons of NEW Halloween Shrine Kits, Cut-Outs, ATC Frames, and much more! The Raven Theatre is one of my favorites! I had the opportunity to visit Edgar Allen Poe's grave while visiting Baltimore a few years ago. Eerie and amazing! So I just had to design a Poe Theatre. Nevermore. 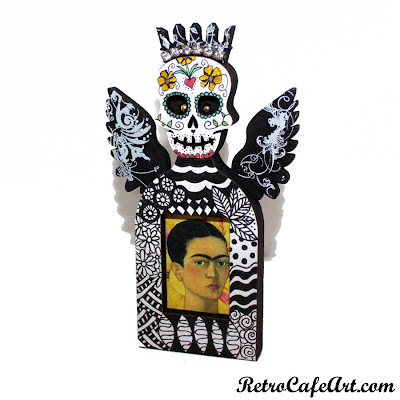 Next to Halloween, Dia De Los Muertos is another favorite holiday of mine! You know I love all the shrines for one. 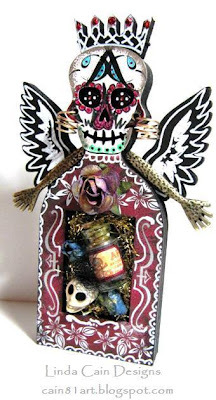 Design Team Member Linda Cain created this wonderful shrine to start celebrating early and there is a giveaway on her blog for a wonderful DOTD goodie pack. Hurry up and leave a comment, winner is being pulled on Monday! 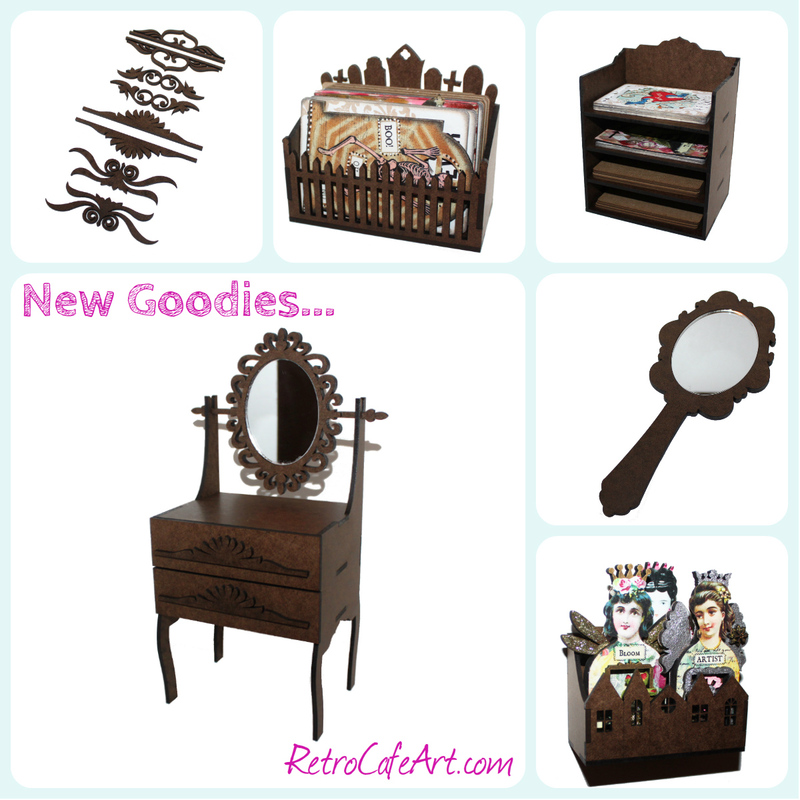 New Goodies + a GIVEAWAY! Hi everyone! I hope you had a chance to check out all the wonderful NEW goodies in the shop this past weekend! It all started with the ATC Vanity and you can see where it went from there! Mirrors, Fairy Boxes, Victorian Flourishes, and so much more. Oh my! The Retro Café Art Gallery Design Team has been busy creating fairies for the Fairy Shrine Swap so I thought I would share them with you. Fairies are due August 19th so you still have time if you would like to join in! The above beauties are by Gerri Herbst! And a gorgeous lot by Linda Cain! I hope you're having a wonderful weekend so far! We've had a few cooler days here this week, especially at night, so I'm starting to feel a hint of fall in the air. Which in my opinion, is the very best time of the year! I'm looking forward to the windows open, cup of tea in hand! To get you in the mood, we have lots of new goodies in the shop with lots of Halloween. See it all HERE. I managed to sneak in some art time yesterday and finally had a chance to play with the Dia De Los Muertos Inspiration Fairy. The Frida image came from the Art Doll Head Paper Cut set. I love adding a bit of Zentangle to 3-D objects. This shrine was actually very easy to create. Cover the pieces you plan to Zentangle with Gesso, doodle, and you are pretty much done. 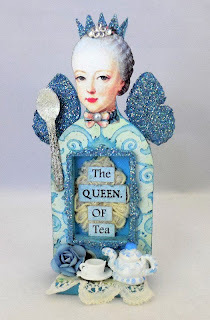 The wings and crown were painted with black acrylic paint and then I added some white rub-ons. I glued a bead in each eye socket and added some vintage rhinestone bling to the crown. In the niche I added a piece from the Wild Flower Background Collage Sheet and a Frida head. The doodling takes a while, but the rest is very simple! New Halloween + a Gothic Tombstone ATC Swap! 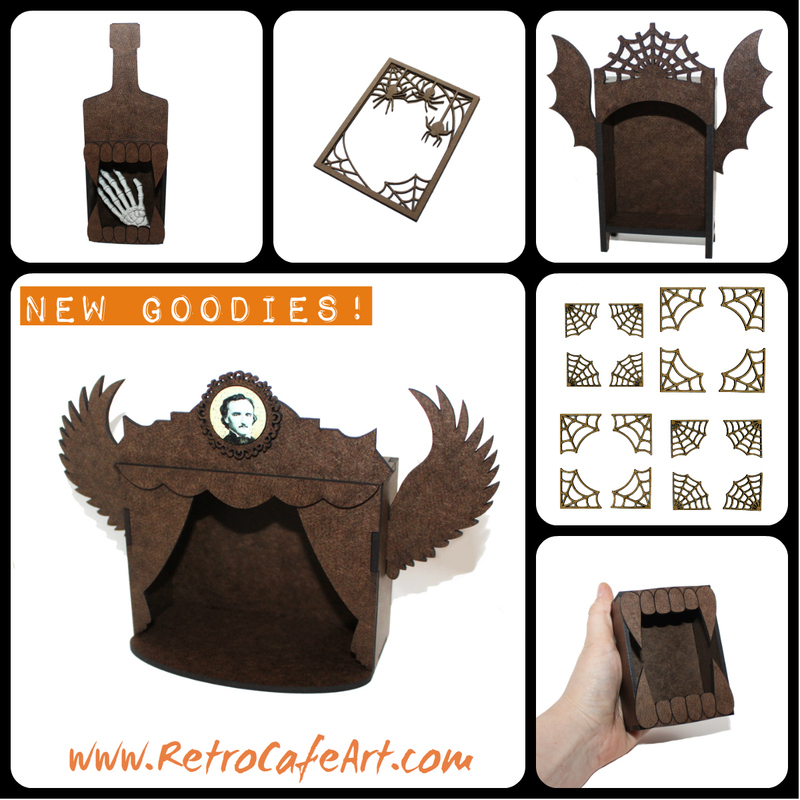 I'm beyond excited about the new goods in the shop this week. 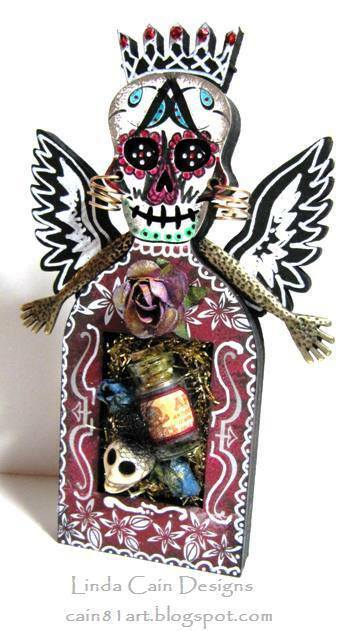 I adore Halloween and it's time to start thinking about all the lovely Halloween arting and crafting ahead. Go have a peek - I'm just getting warmed up!!! Won't you join me? Another Swap? Why yes! I figured since I already knew what I was going to do, I might as well post and give you PLENTY of time! 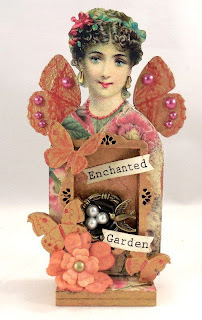 Last year we had a wonderful Gothic Tombstone ATC Swap (you can see the photos here on Facebook) and several of you asked if we would do it again. Either you missed out or you wanted more. I never repeat swaps so my solution was NEW TOMBSTONES! That's right! I've designed 5 new tombs so we could (sort of) do it again! But don't panic, they aren't due until October 7th! Our Fairy Shrine Swap is off to a marvelous start! 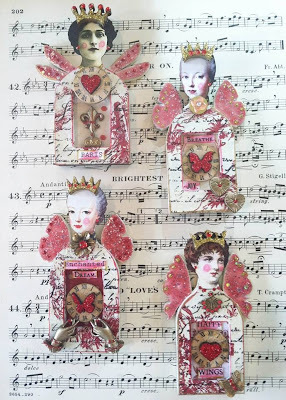 Design Team Member Linda Cain already has six fairies completed! 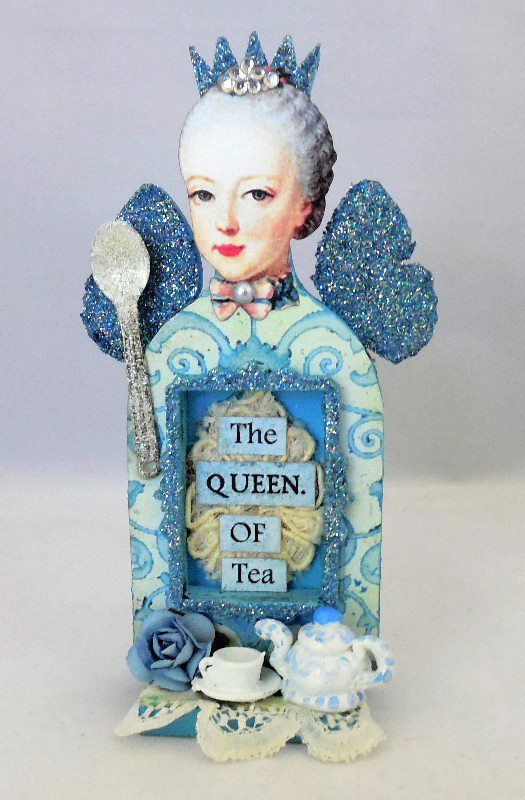 Not only that, she's given you some step by steps and tips on her blog! You can find Linda's inspiring post HERE.